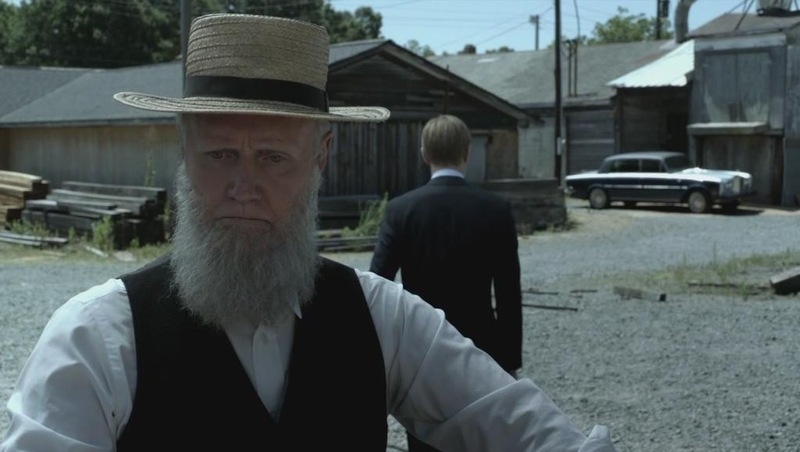 Alpha Trivette is the stern elder of the Amish community in Cinemax’s fictional town of Banshee, a prominent and pivotal character in the sprawling, media-spanning mythology of the show, but he is also a fan of the hit series, as we learned in Part 1 of our interview with the Atlanta-based actor. Alpha Trivette plays Israel Proctor on Cinemax’s ‘Banshee’, filmed in Charlotte, North Carolina. “Even if I weren’t in the show, I would still like it,” Alpha told us during our telephone conversation last week, as we discussed what brought the veteran actor to Banshee, what the future holds for his patriarchal character, and even his thoughts on film tax incentives. Click here for Part 1, and then scroll down to read Part 2 of our candid interview with Alpaha Trivette! Banshee is innovative and even groundbreaking in its use of social media and online webisodes to not only advertise and promote the series, but actually serve as functioning adjacent plot details that more fully color the show’s overall mythology, and we asked Trivette his opinion of this new use of modern technology. “When I did morning radio (in Charlotte, North Carolina),” Alpha said, “the thing that made radio so attractive is that people who listen actually feel like they know this person, and that is what Banshee created with these extra mediums. 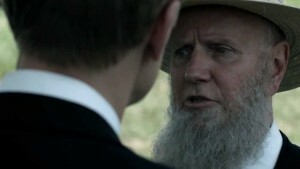 We also asked if Alpha if he could give us any predictions as to what to expect down the road in the town of Banshee. 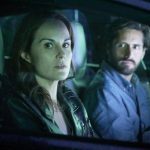 “If you’ve been watching this season,” he said, “in Episode 3, my grandson Solomon had been kidnapped, and of course Kai goes to great lengths to find his whereabouts. When he’s located, I show up on the scene and I just say, ‘God brought him back to us.’ I’ve got a feeling that might tend to create some tension, even more so. “And now that he’s (Kai) got a mom, in that episode he showed some incredible tenderness toward his mother. So you might look for some of that stuff, and look for more reveal of the intimacies of these characters, because there are back stories to everybody, and so many side stories and intricate relationships. 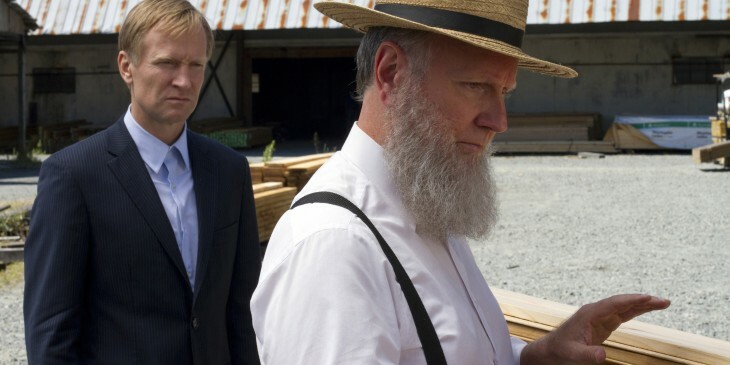 Ulrich Thomsen and Alpha Trivette star as father and son in ‘Banshee’. A Charlotte area resident for many years, Alpha told us he was happy to spend more time on the North Carolina set during filming of Season 2 than he did for the first season. “I actually spent more time on set in Season 2, even though I’m in fewer episodes,” he said. “I stuck around for a week, even though I only shot for two days, which I don’t mind, because I do enjoy Charlotte. “They normally start (filming) around April or May when the cast starts to gather back in from all over the world. I see on Facebook when Ben Cross is coming back to the States and he’ll be looking for a place in Charlotte, or when Ulrich is coming back to the States, so yeah, that usually happens about May. I expect that if I’m in episodes next season, then we’ll start shooting shortly after that. Alpha further discussed being a working actor in North Carolina, a career he began more than 30 years ago while working as a stand up comedian and radio personality in Charlotte . “While I was living in Charlotte,” he recalled, “they opened up the De Laurentiis Studio in Wilmingon, and I was cast and given a small part in King Kong Lives. I just got a royalty check for that the other day. It was like $2.50 or something. I did that and CBS TV movie called A Time’s Triumph, which starred Patty Duke, about the first woman to complete the army flight program. I played her drill instructor. Alpha has been extra busy lately, with a number of film projects completed and on the way, but he’s especially proud of an upcoming stage project. Alpha Trivette is Israel Proctor on ‘Banshee’. North Carolina’s film industry is currently in danger of loosing many of its biggest productions, including Banshee, if the state’s film tax incentives are allowed to expire in December as currently scheduled. Supporters hope that the upcoming short session of the General Assembly in May will see some kind of extension for the incentives, however, many in Raleigh remain unconvinced of their validity and are opposed to an extension. 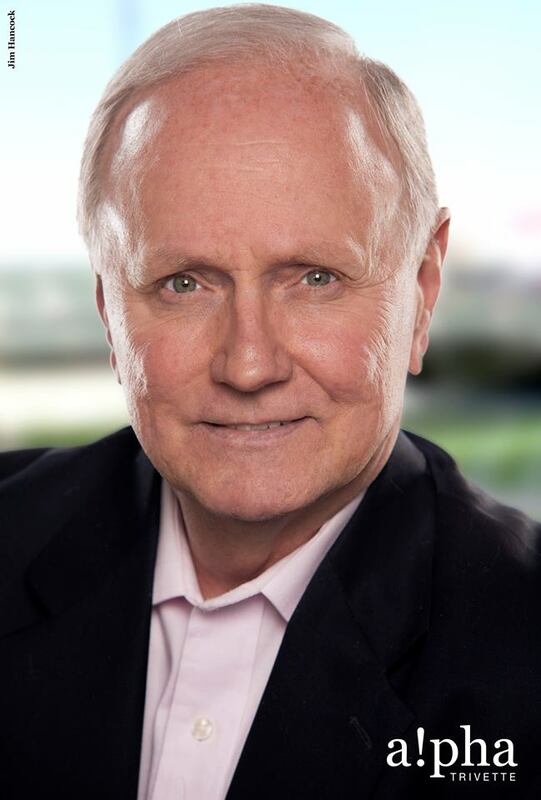 As an actor who has worked in North Carolina off and on for the past three decades and who now lives and also works in Georgia, a state with a hugely successful film incentive program firmly in place, we had to ask Trivette his opinion on the debate. “I know North Carolina is struggling to keep (film projects) there,” he said. “It’s become so big here in the Southeast. You’re getting competition from South Carolina which has permanent tax breaks, and Georgia that continues to grow all the time. But you’ve got so much good stuff going on there. Sleepy Hollow, I’m a fan of that and I’m hoping to get cast on some of those shows as well. “When you bring in that kind of money, employing not just workers but crew, technical people, ancillary jobs like catering and other things, it’s been tremendous for Georgia and the Atlanta area. “Now we’ve got Pinewood Studios coming in, and they’re starting right away. Another studio opening is going to be the biggest on the Southeast. And then there’s Tyler Perry’s studio. There’s so much stuff going on and so many offerings, so that’s why a lot of people are moving to the Southeast now, because there’s work. Be sure to check out Part 1 of our interview here, and look for Alpha Trivette as Israel Proctor on Banshee at 10pm Fridays on Cinemax. Can’t wait to watch this episode.